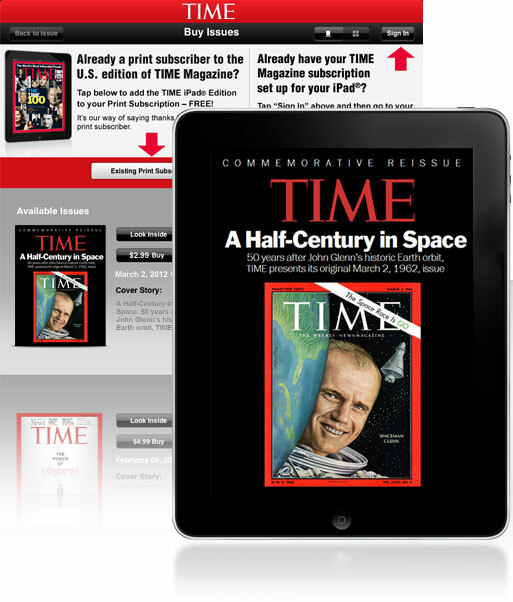 Half-Century after John Glenn's historic Earth orbit, TIME presents its original March 2, 1962, issue. Click below to download the TIME app and get the Commemorative Issue on your iPad® for $2.99! Click below to activate Digital Access - FREE for the entire length of your current subscription term! Already activated? Go to the library within your TIME app to download. iPad® is a trademark of Apple Inc., registered in the U.S. and other countries. App Store is a service mark of Apple Inc. TIME is a registered trademark of Time Inc.